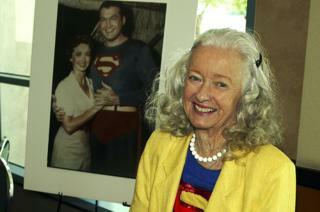 Actress Noel Neill, who was the first to play the character of Lois Lane on screen, has died at the age of 95. She died on Sunday at her home in Tucson, Arizona, after a long illness, according to her manager and biographer Larry Ward. Neill played the Daily Planet reporter in the 1948 and 1950 movie serials alongside Kirk Alyn as Superman. She also played Lois Lane in the TV series Adventures of Superman alongside George Reeves between 1953 and 1958. Neill also made appearances in the 1978 Christopher Reeve Superman film, in an uncredited role as Lois Lane's mother Ella, and in the 2006 Superman Returns film, starring Brandon Routh. She also appeared in a 1992 episode of the TV series Superboy, based on Superman's younger years. Born in Minnesota, she was the daughter of Minneapolis Star Tribune news editor David Neill and New York vaudeville performer LaVere Neill. She started singing and dancing as a child and performed at county and state fairs throughout the midwest in the 1930s. Neill moved to Hollywood at 18 and soon got her big break when she was hired by Bing Crosby to sing at his Turf Club at the race track in Del Mar, California. In 1941 she was signed up to a contract by Paramount Pictures. Noel made close to 100 films in her career and worked with directors including such Cecil B DeMille and Vincent Minnelli and actors Bob Hope, Crosby and Gene Kelly. In the 1940s and 1950s she appeared in many Westerns and was awarded the 2004 Golden Boot Award - for her many Western films. There is a statue of Lois Lane in her likeness in the town of Metropolis, Illinois. Ward said she was still making personal appearances and attending book signings into her 90th year. "Noel truly was Lois Lane, and for many of us, she was the first working woman seen on television. Few of her fans actually knew her real name, almost always simply calling her 'Lois' to which she would unfailing answer with a bright smile and a kind word. "It was more than a role to her. 'Lois' was someone she believed in and a character she happily and warmly embraced," he said. Star Wars actor Mark Hamill has also paid tribute - "They say your 1st is always your favourite. I LOVED Noel Neill as Lois. She was sweet warm & wonderful in person too!" he tweeted. A public memorial to the actress will be held later this year. The character of Lois Lane went on to be played by Margot Kidder in the four Christopher Reeve Superman movies in the 1970s and 80s and Kate Bosworth in 2006's Superman Returns. The role has also been played by Amy Adams in the most recent Superman films Batman v Superman: Dawn of Justice, Man of Steel and she is currently filming Justice League. On TV Teri Hatcher in the ABC series Lois & Clark: The New Adventures in the 1990s and Erica Durance in Smallville between 2004 and 2011.